Offering services to bring your operation to the next level. Grass Farmer Supply also offers consulting services for producers needing more tools and advice to take their holistic livestock operation to the next level. 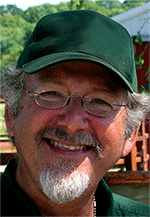 Will Winter DVM and founder of Grass Farmer Supply, offers consultations. He has over 30 years of full-time practical experience utilizing many forms of holistic and alternative modalities; including homeopathy, herbal medicine, acupuncture and chiropractic healing. He is also a livestock nutritionist, pet food formulator and grazing consultant; he lectures, teaches, and writes for several national magazines and newsletters.